This large mirror has a two-tone frame with a mostly Cameo cream finish and a Brunette finish on the inner and outer molding. Due to its large size this mirror is heavy and must be hung on a stud with heavy duty mirror hangers. Use this piece up against a wall to make a room feel and look totally different. The glass mirror is made of one large piece with a “V” grooved pattern. Sophisticated and classy, this large mirror is an awesome piece to incorporate into your home. The Haven Large Mirror with Two-tone Wood Frame by Bernhardt at Malouf Furniture Co. in the Foley, Mobile, Fairhope, Daphne, and Gulf Shores, AL area. Product availability may vary. Contact us for the most current availability on this product. Finish & Paint Options Finishes used include a medium brown Brunette and darker Raven that both have rose undertones while the light Cameo finish is used on accent pieces. Handles & Hardware Solid brass handles, knobs and drop pulls in a Vintage Nickel finish are used while some pieces features faux horn inlays and quatrefoil shapes. 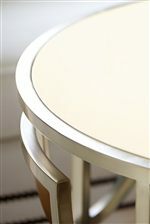 Case Detail Edges vary throughout collection with round edges on tables and fluting used throughout. Slim tapered legs have metal ferrules on the end and adjustable glides. The Haven collection is a great option if you are looking for Contemporary furniture in the Foley, Mobile, Fairhope, Daphne, and Gulf Shores, AL area.